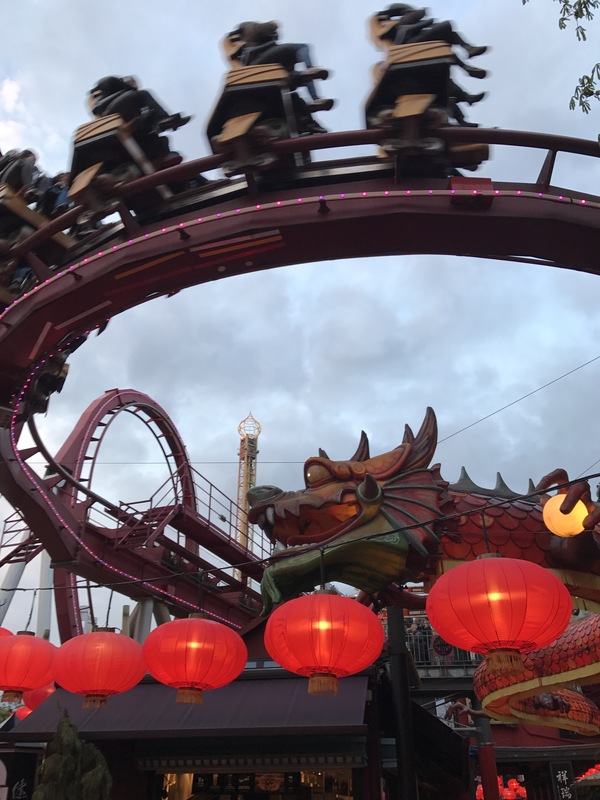 Rides either terrify or bore me. 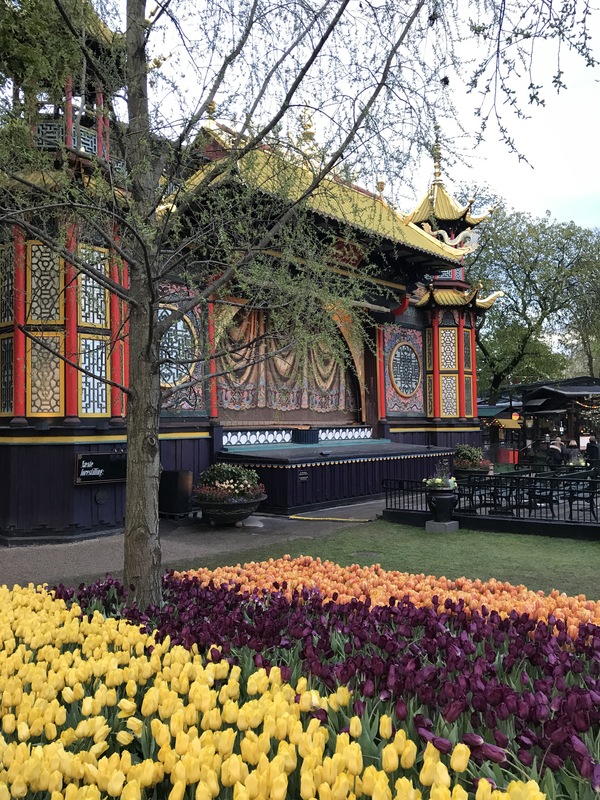 But I loved Tivoli in Copenhagen. 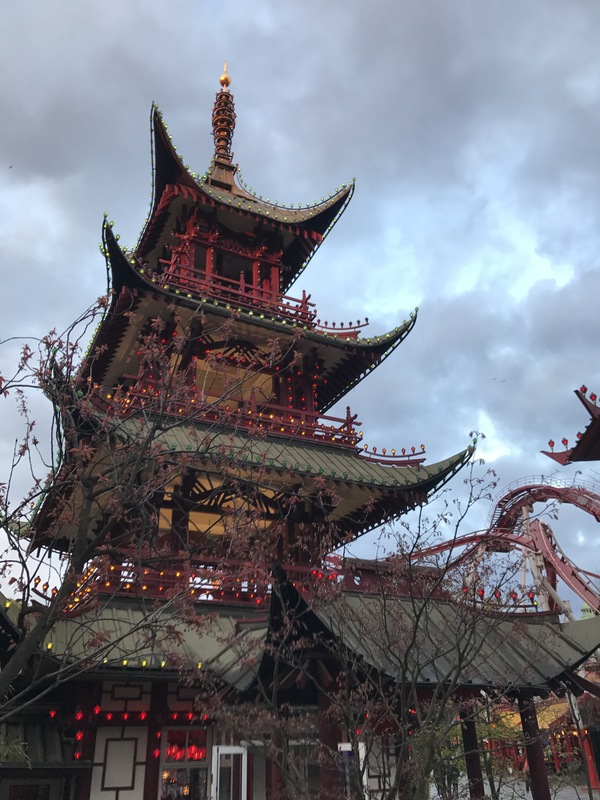 The park opened in 1843, just outside the west gate of the still-walled old city. King Christian VIII was worried about social unrest at the time. Workers all over Europe were annoyingly demanding higher wages and shorter hours. 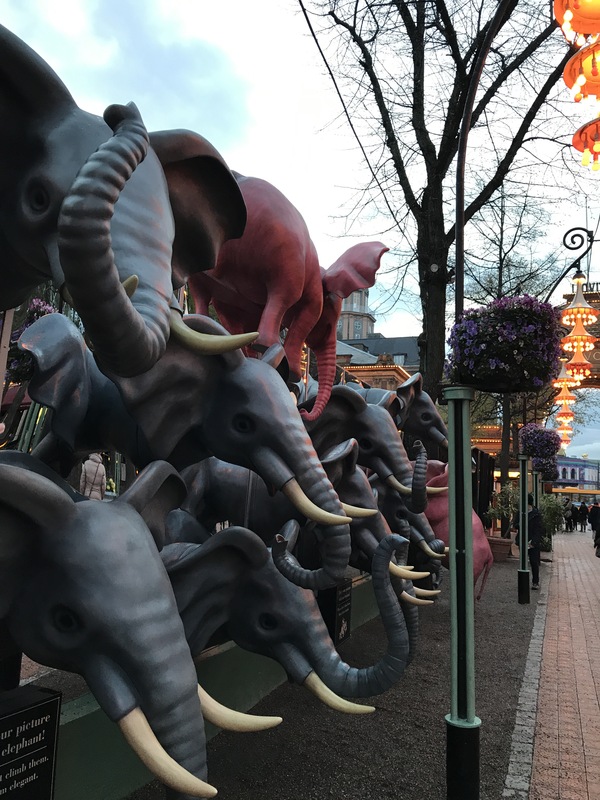 The founder of the park, George Carstensen, convinced the king that if the people have a place to amuse themselves, “they do not think about politics.” As the city expanded, Tivoli became almost the center. That’s the tower of the City Hall in the background. I visited at twilight because I wanted to see the fabled lights. So were the thousands of tulips. 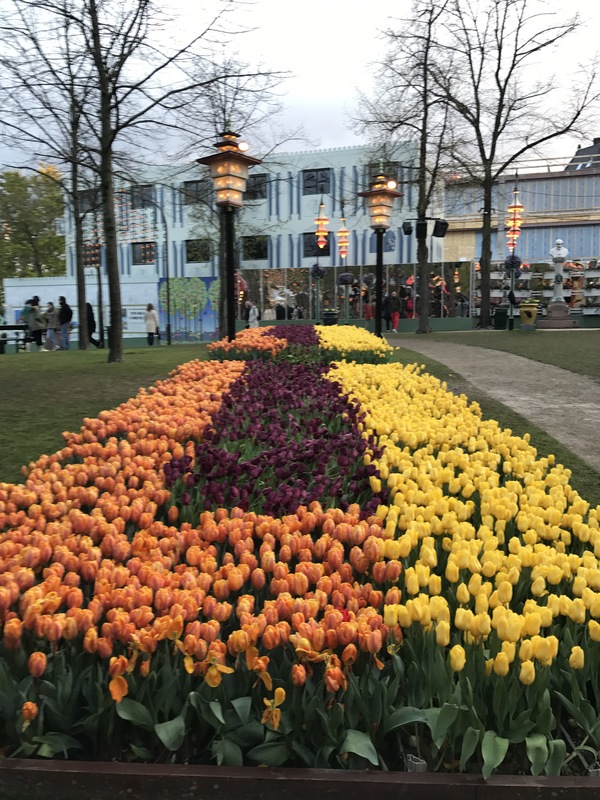 In fact, the flowerbeds were so perfect that I wondered if gardeners came in nightly and replaced them with fresh plants straight from a greenhouse. A rock band was getting ready to set up at the Chinese theater. The theater dates from 1874. 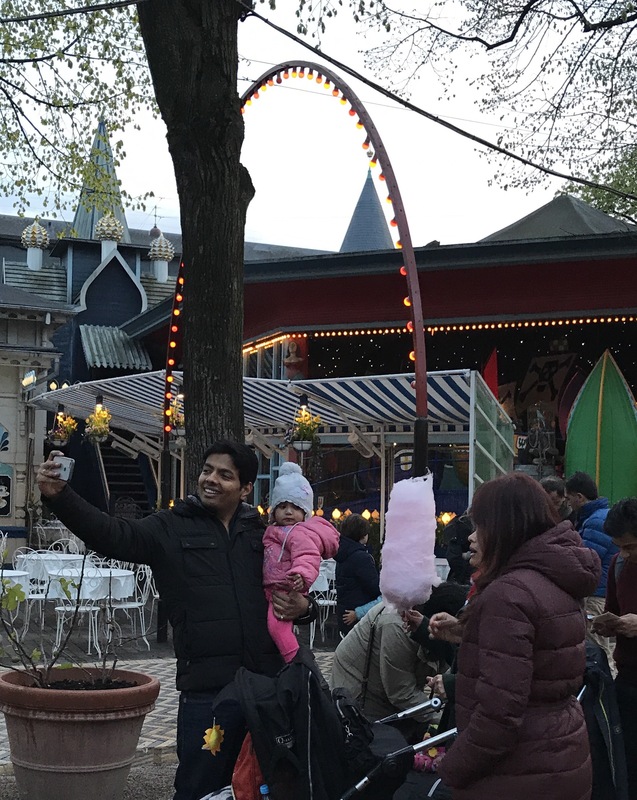 Families strolled and let cotton candy melt in their mouths. 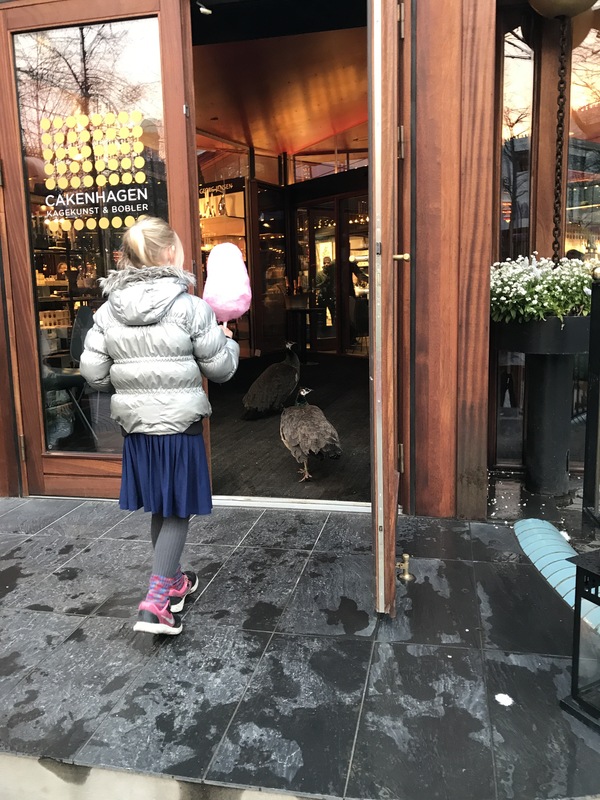 A pair of peacocks wandered into a restaurant. 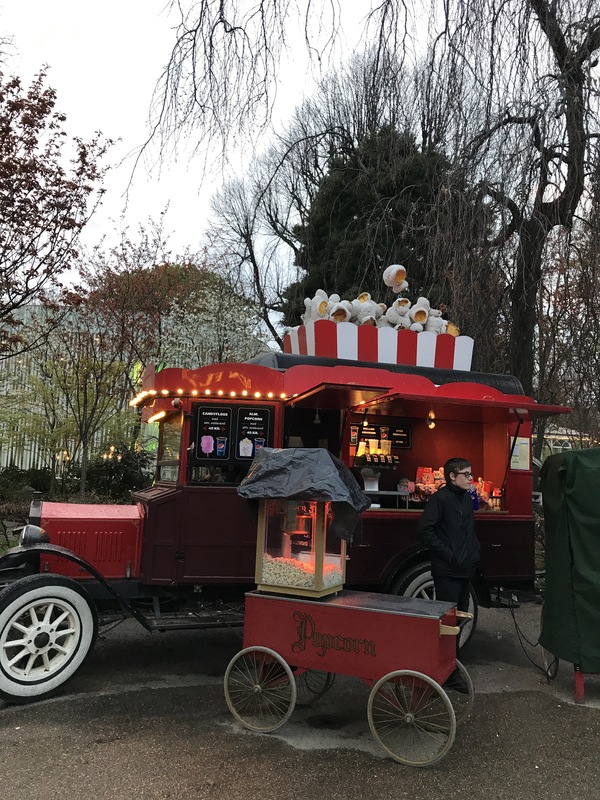 There are any number of restaurants, plain to fancy, plus food carts strategically placed. 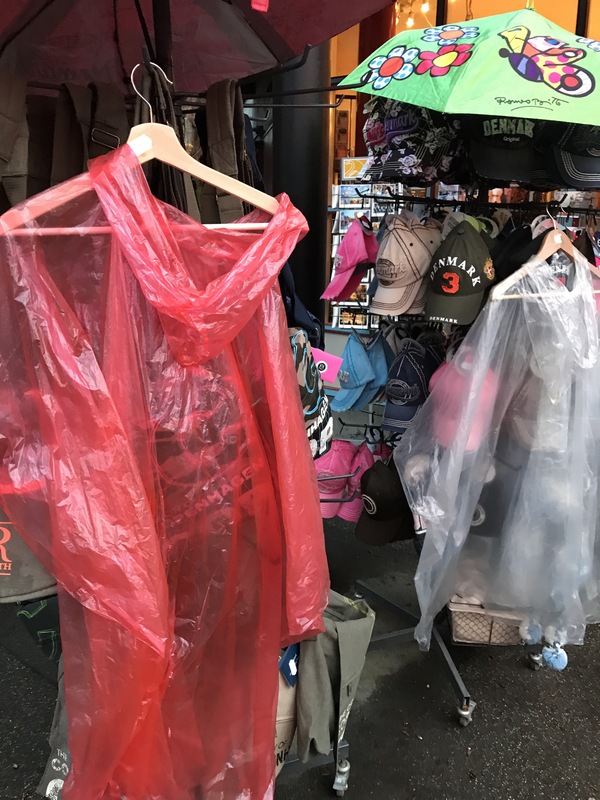 Raincoats for sale? Sure. It rains quite a bit in Copenhagen. 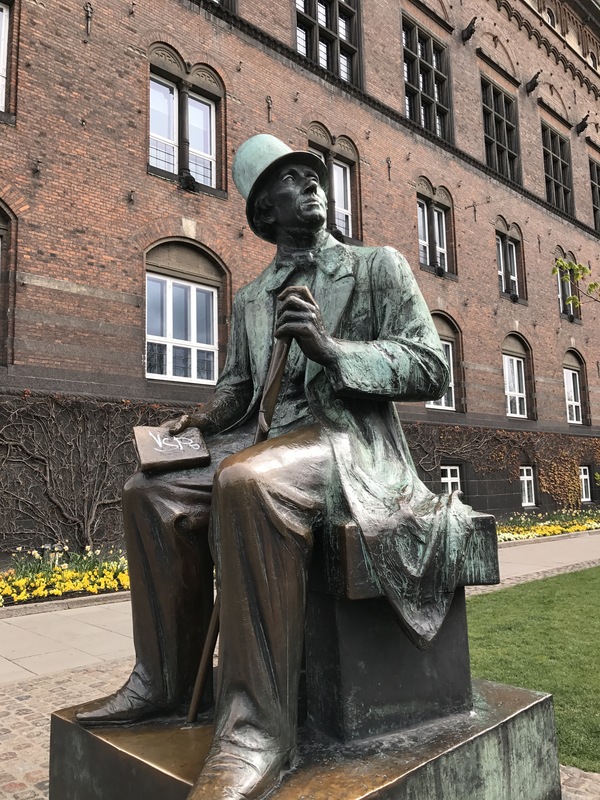 Hans Christian Andersen, 1805-1875, is pretty much the secular patron saint of Denmark. 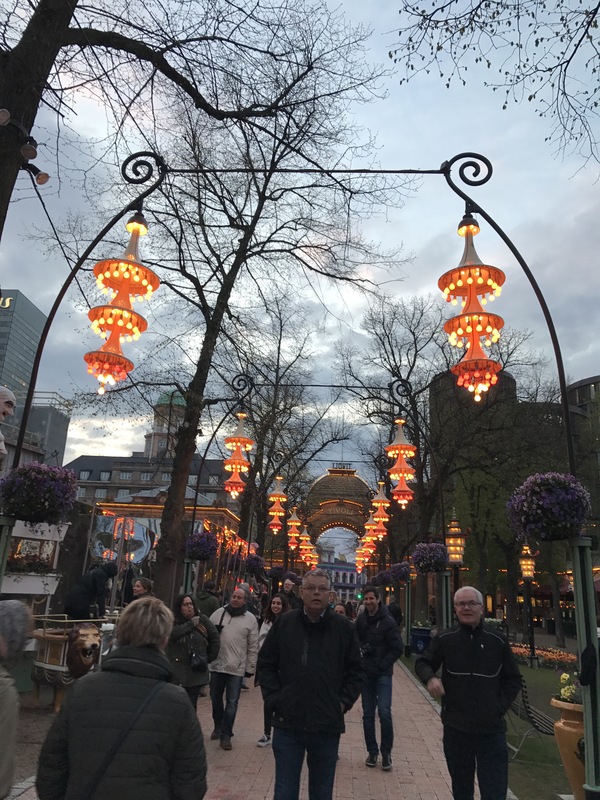 He loved Tivoli Gardens. In 1965, the city put up a bronze more-than-double life size statue of the writer of at least 125 fairy tales, just outside City Hall. He’s holding his place in a book while he gazes up at the bright lights of Tivoli across the street. His knee is brightly polished because everybody sits on his lap for a photo. The sculptor was Henry Lucknow-Nielsen. 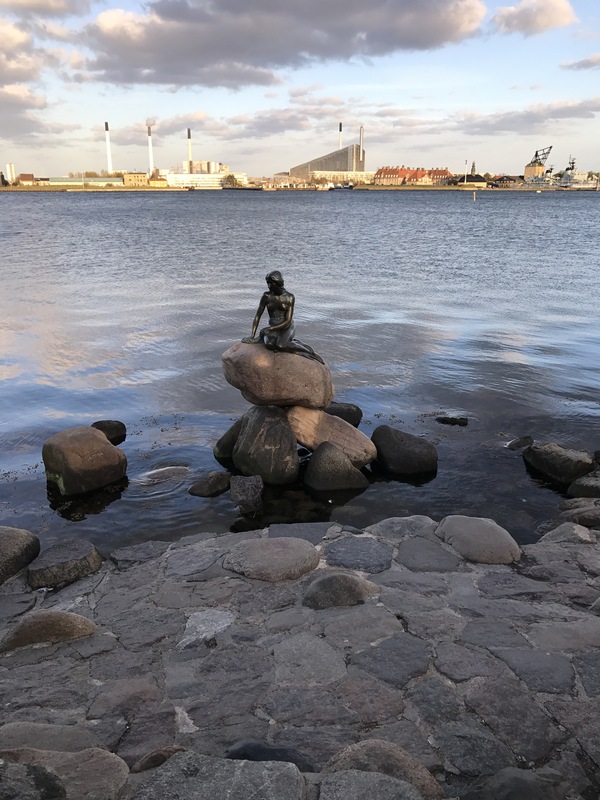 Across town, the wistful sculpture of Andersen’s Little Mermaid draws rowdy crowds from the nearby cruise port. 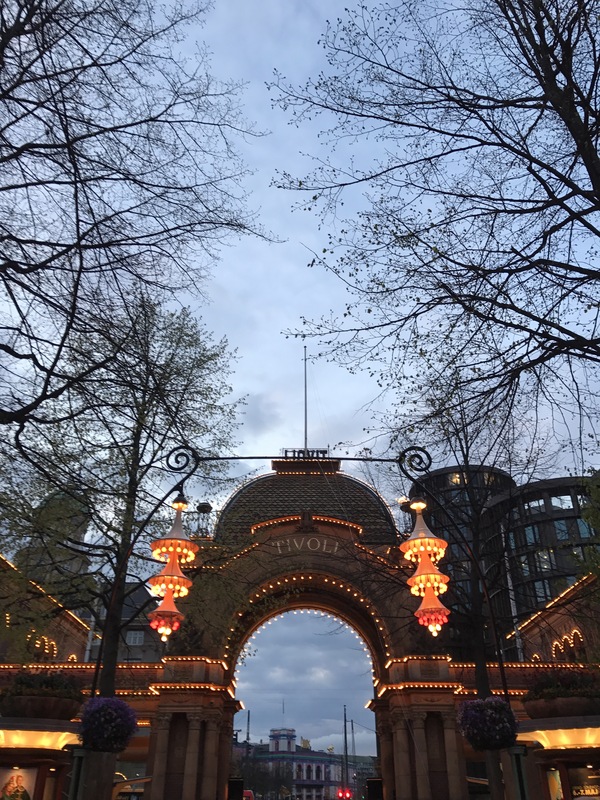 It may be all some people really see of Copenhagen. Minus the crowds, the mermaid is lovely. She seems to ignore the busy harbor behind her. I’m sure she dreads the rowdy cruise-boat crowds, but maybe she’s off in her own world. 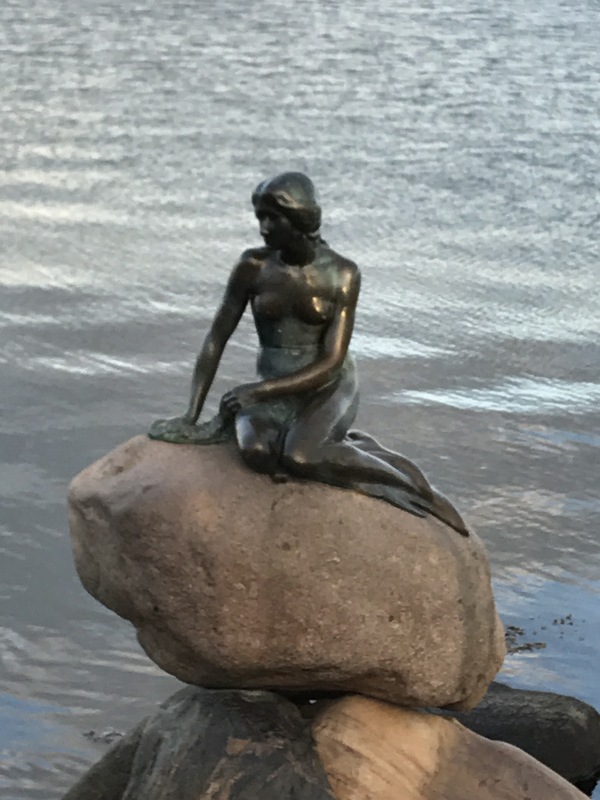 Edvard Eriksen created her in 1913. 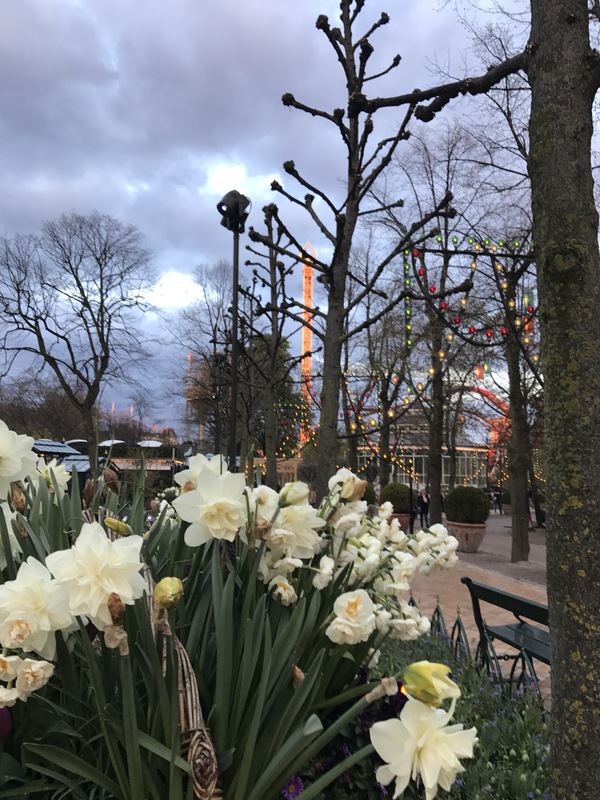 Tivoli in springtime did not disappoint. 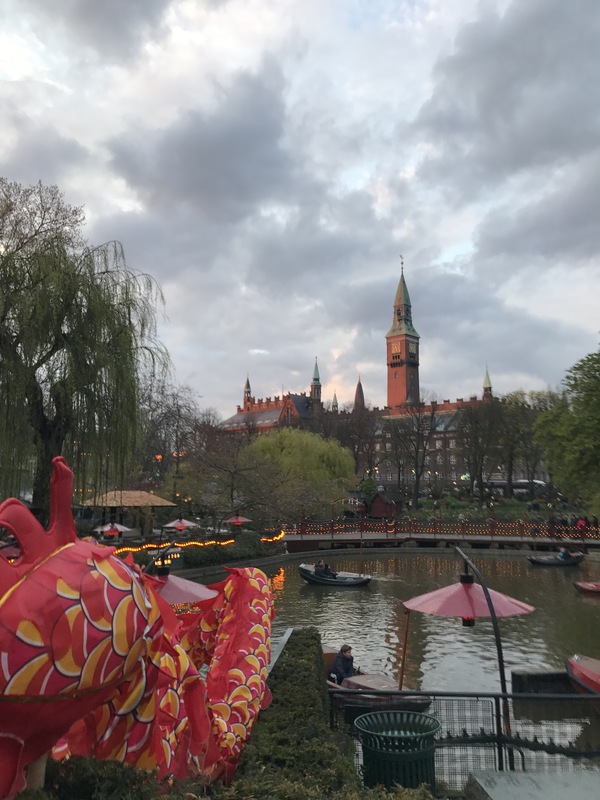 I loved Copenhagen so much that I’m going back in December (cheap off-season airfares helped). Will it be cold? Afraid so. 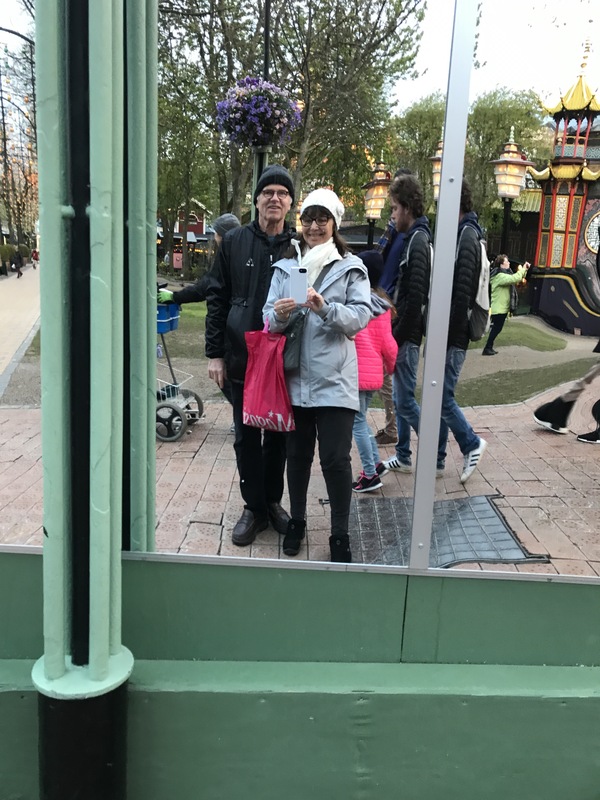 It was cold enough for mittens and wool hats in early May. But I expect Chrismastime in Scandinavia to be a fairy-tale experience. Plus there may be snow! Join me next time for more explorations in the art, literature and history of Europe! 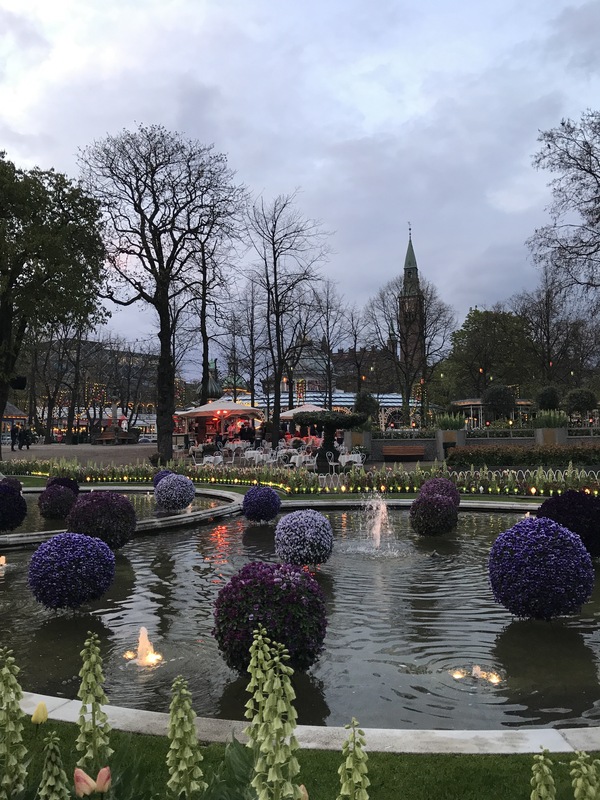 This entry was posted in Books, Denmark, Explore Europe, Historical Figures, Literature, Scandinavia, Why I Love Denmark, Writers and tagged Copenhagen, Hans Christian Anderson, Tivoli Gardens on October 23, 2017 by Claudia Suzan Carley. Emily Bronte was born on July 30, 1818. Her brother Branwell, an aspiring poet and portrait painter, composed one of the very few images of her. His sister Emily was painfully shy, hardly speaking with anyone outside the family. But she was a bold artist. 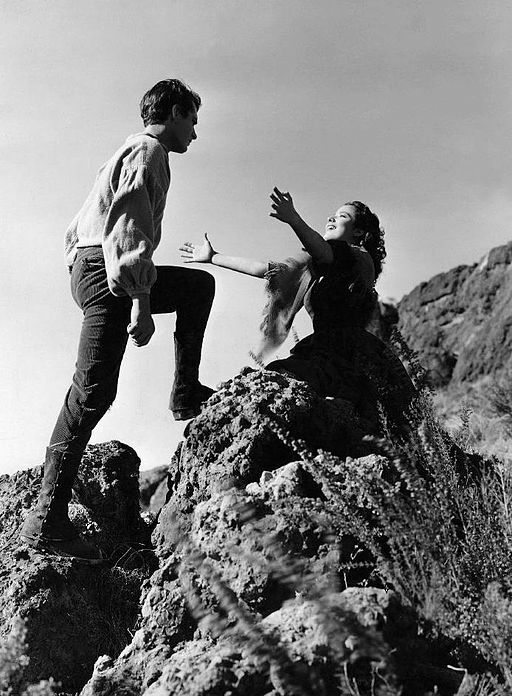 Her novel, Wuthering Heights, is still startling in its passion and social critique. Branwell was the only son in the family and great things were expected of him. I think poor Branwell suffered from what we might now call Preacher’s Kid Syndrome: a need to act out, just because his father, the Reverend Patrick Bronte, was such an upright man. Branwell studied painting, in between bouts of drinking, taking opiates, and getting fired from various gigs as a tutor–for which his father had taken great pains to educate him. 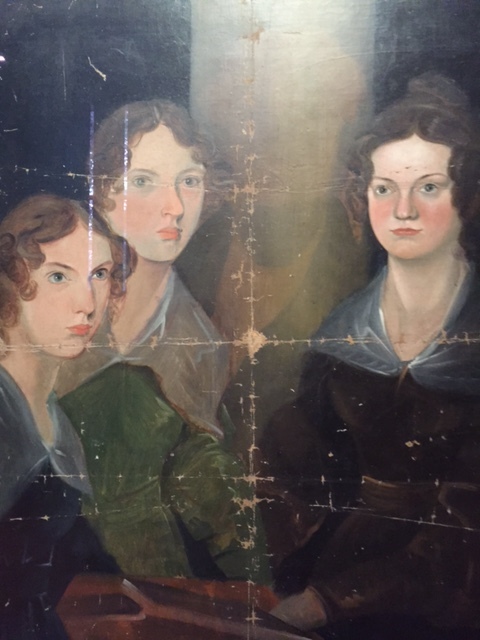 In around 1834, at age 17, Branwell painted the group portrait above. It is now one of the most treasured works in London’s National Portrait Gallery, and the centerpiece of a special Bronte exhibit I saw last spring. Why is this rare painting folded in the middle? 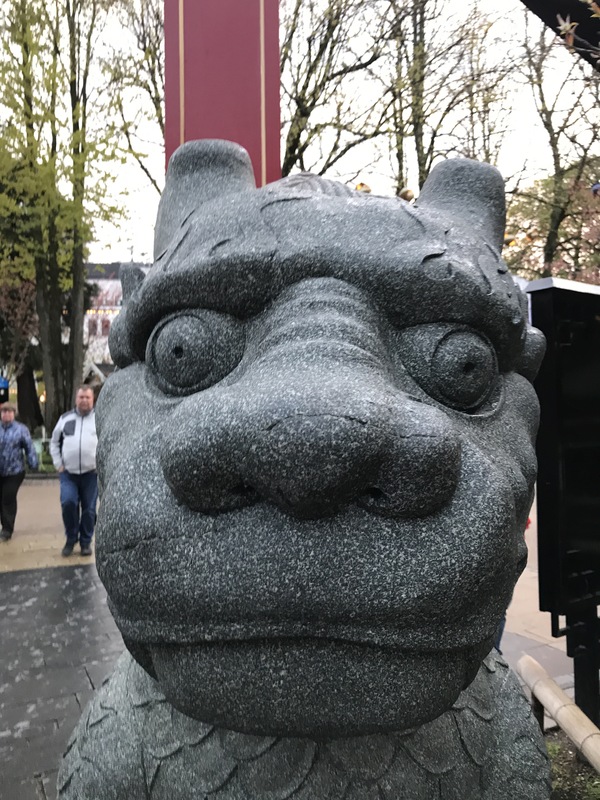 We’re lucky that it still exists, damaged as it is. 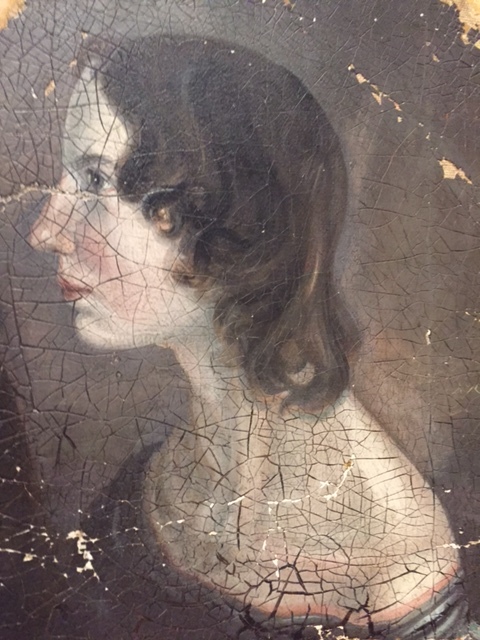 The portrait, together with the profile of Emily, traveled to Ireland with Charlotte Bronte’s widower after her death as a young bride. It appears that a heartbroken Arthur Bell Nicholls shoved the portraits of his beloved Charlotte and her sisters on top of a wardrobe in an Irish farmhouse, out of sight and out of mind. 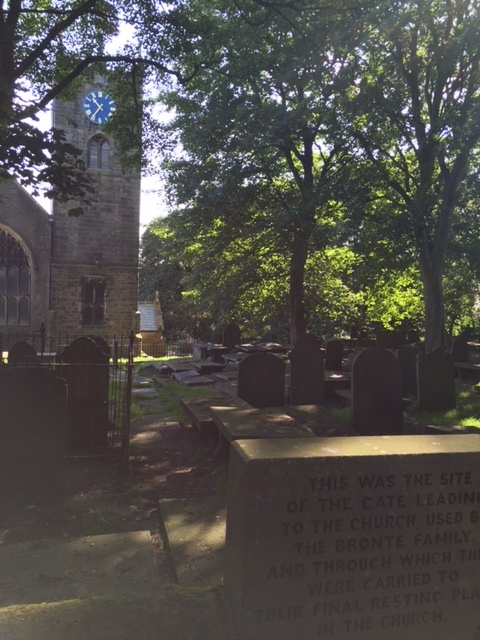 The churchyard where all the Brontes are buried (except Anne, who died at Scarborough and was buried there) is just outside the door of the parsonage. Living there, walking every day past the graves of so many loved ones who had died so young, must have been unbearably sad. By the time Charlotte died, shortly after her marriage and while pregnant with her first child, Branwell, Emily and Anne were already dead. Most likely they died of either tuberculosis or infectious diseases from the poor sanitation in the village. (Branwell more or less drank himself to death). Nicholls stayed in Haworth for several years to care for his father-in-law. Nicholls eventually remarried. His widow finally discovered the paintings (housecleaning, no doubt) in 1914. 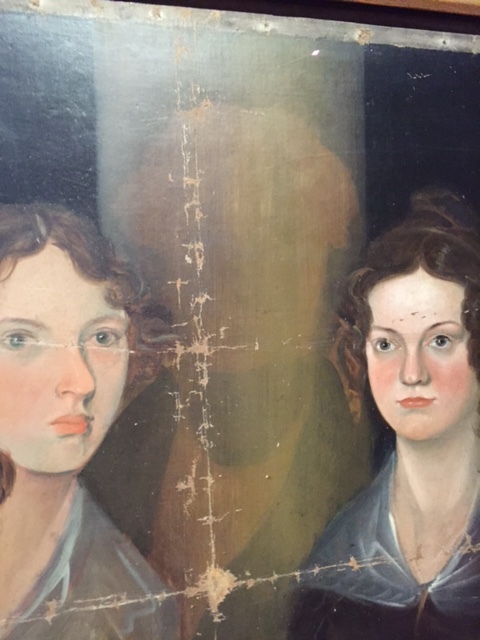 Sadly, it seems that Branwell had erased himself from the family portrait. This fact was not known until the 1950s, when the oil paint became more transparent with age. Now, it is clear that there was once a man’s figure between the sisters. Did Branwell already have such a low opinion of himself? Was he ashamed to be seen with his much-more-virtuous sisters? Or did he feel he could not do justice to his own wonderfulness? Or was this possibly a portrait of his father, who took a very dim view of Branwell’s nights spent in the local pub or worse? We’ll never know. 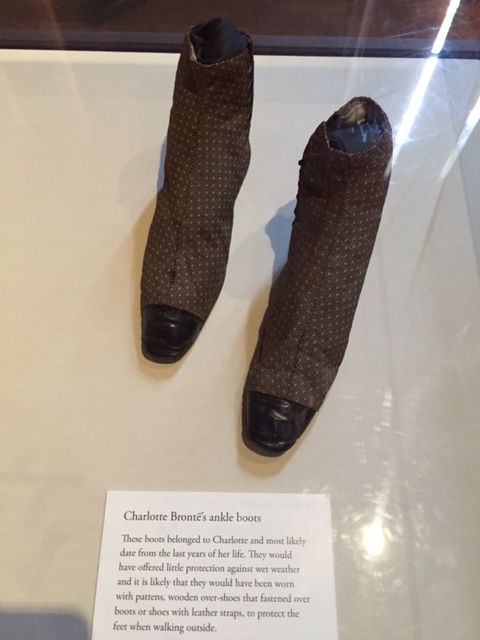 The London exhibit also contains items such as Charlotte’s tiny boots. The caption says that for outdoor wear, the boots were most likely worn with wooden platens strapped to the soles for a little protection against mud and snow. 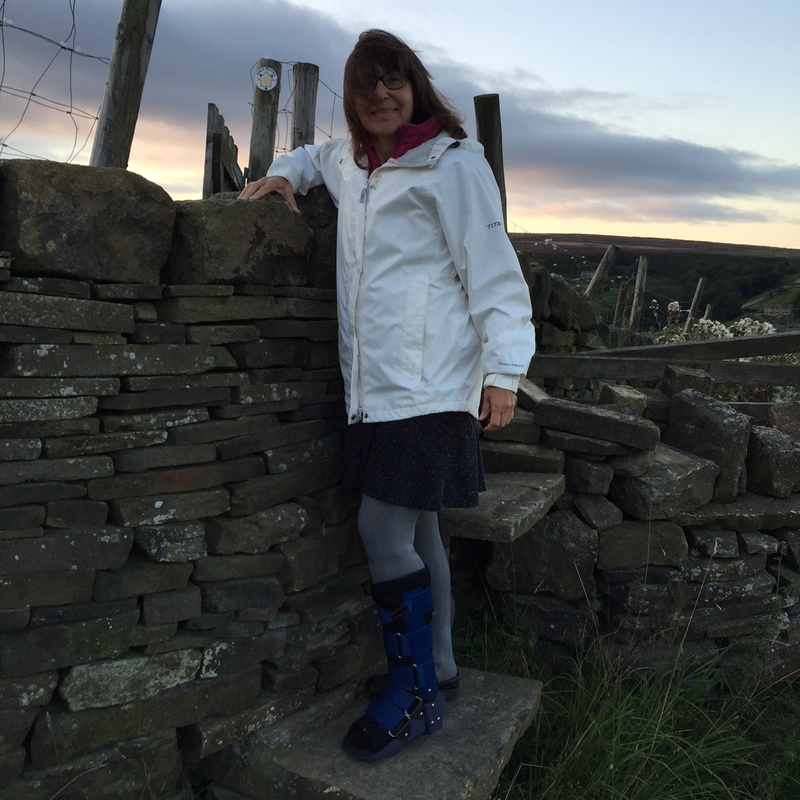 How did the Bronte girls manage to walk for miles in the rugged North Yorkshire moors in footgear like this? 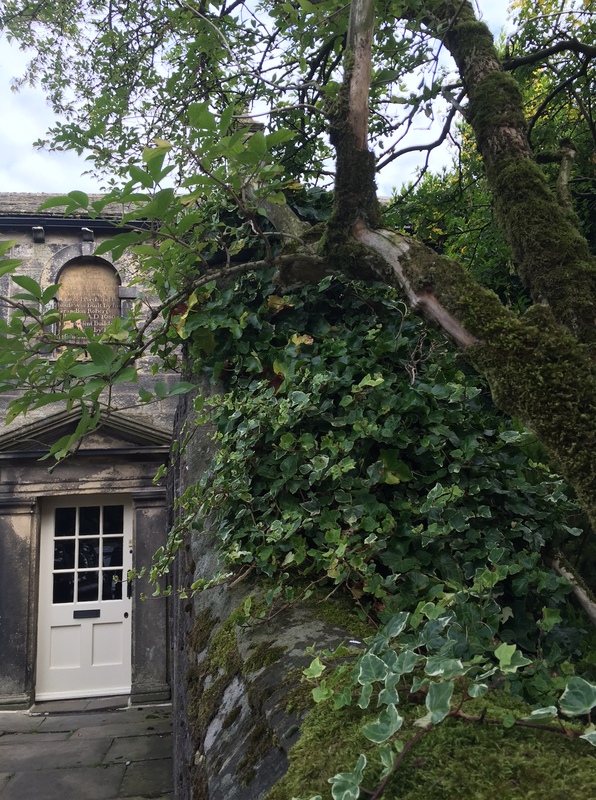 Last year I made a literary pilgrimage to Haworth in Yorkshire. The town still looks much the same as it did when Emily composed her novel about wild forbidden love on the moors. 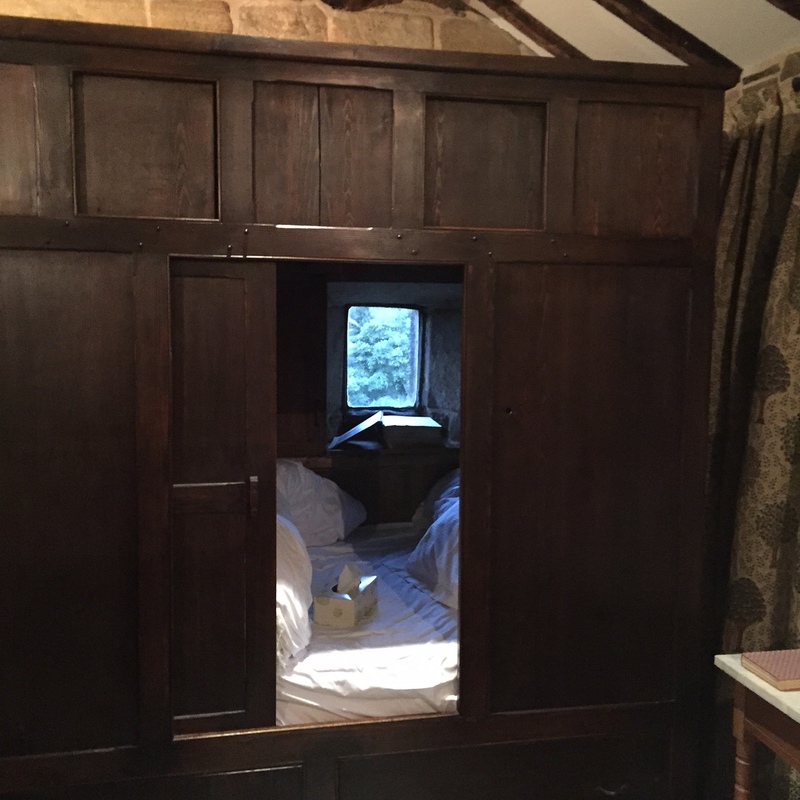 I was lucky enough to stay at Ponden Hall, a house where the Brontes were regular visitors. 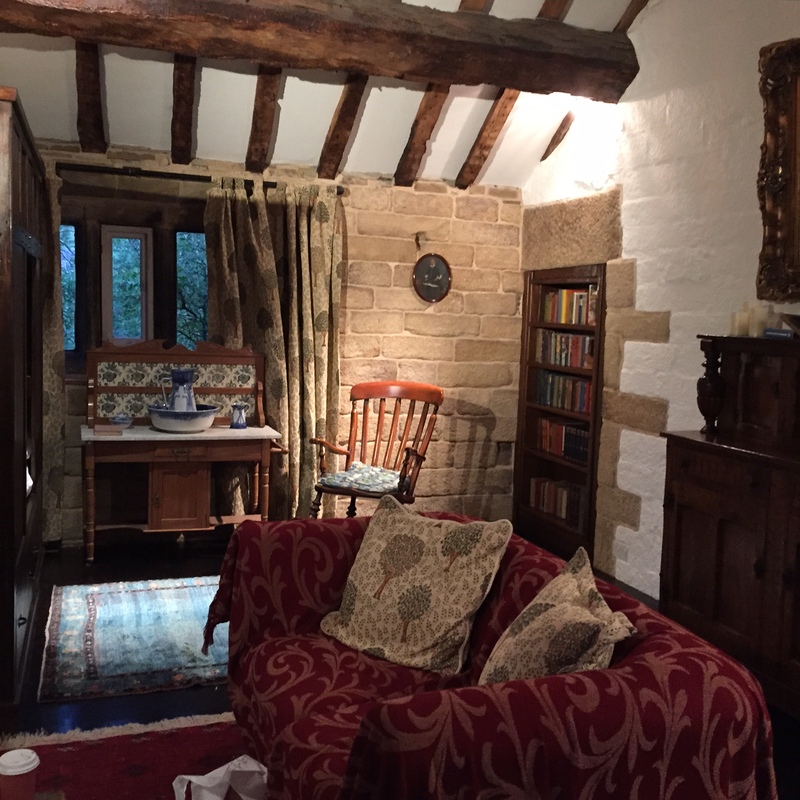 It’s now a family home, a lovingly run bed and breakfast, and a venue for gatherings of artists, writers, and Bronte fans. 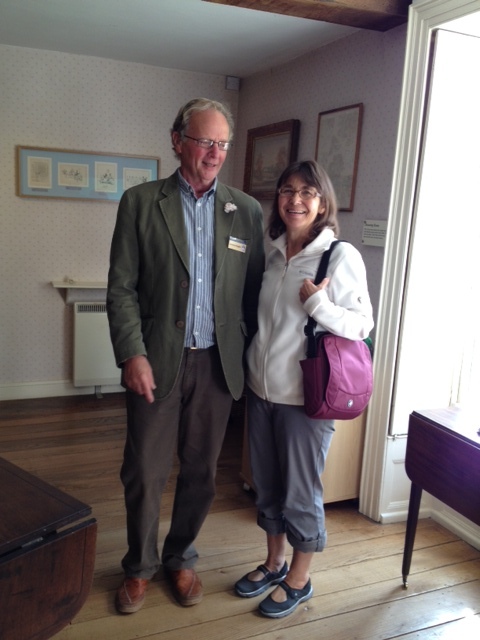 The charming hosts go out of their way to show all visitors around their historic home. In the photo below, the bookcase is a hidden door into a secret library. 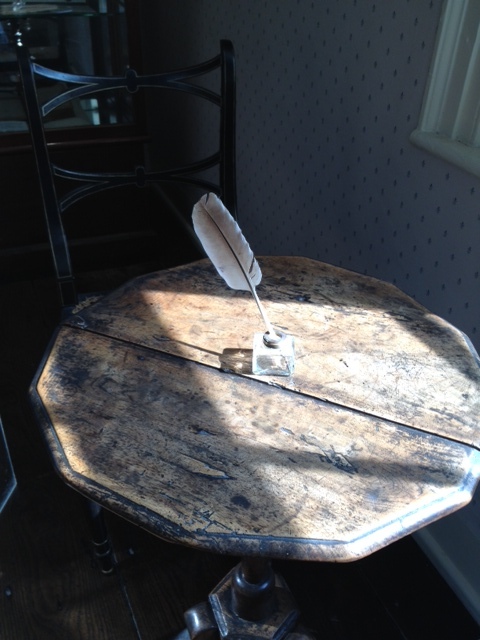 The Bronte girls used to visit the house, a couple of miles from the parsonage, to use the library. In 1939, Laurence Olivier and Merle Oberon played the lovers Cathy and Heathcliffe in the classic romantic film based on the novel. Since then, there’s been a 2011 film version that makes explicit the racism that Emily only hinted at in her novel, by calling Heathcliffe a “gypsy.” It’s on my list to watch. There’s a 2009 miniseries, too. Did I venture onto the wild moors myself? Only partway. I had a broken foot, thanks to a super-klutzy fall just before I left on my trip. But I’m determined to hike the moors. Next time, I hope I’ll be able to follow the signposts and get just a little bit lost in the wild countryside that inspired Emily Bronte and her sisters. 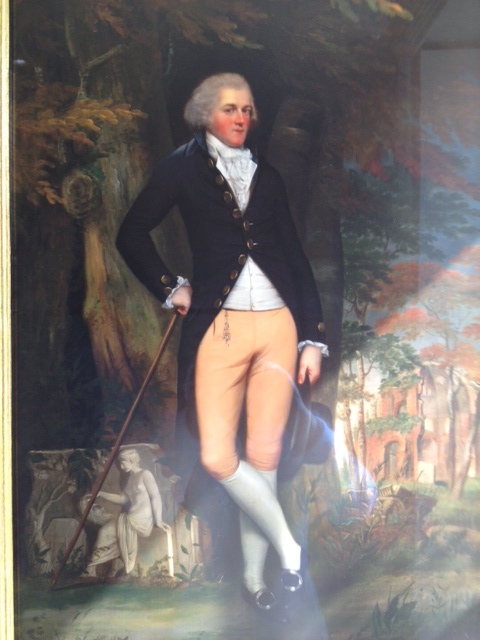 Join me next time for more explorations in the art, history and literature of Europe and the British Isles! This entry was posted in Books, British Isles, England, Film and TV, Film and TV locations, Historic Homes, Historical Figures, Literature, Why I Love England, Writers and tagged " Branwell Bronte, "Wuthering Heights, Anne Bronte, Arthur Bell Nicholls, Charlotte Bronte, Emily Bronte, Haworth, Ponden Hall, Yorkshire moors on July 29, 2016 by Claudia Suzan Carley.